Designer: William Barber. Weight: 27.22 grams Net weight: 0.7874 oz pure silver Composition: 0 .900 silver, 0.100 copper Diameter: 38.1 mm Edge: reeded Minted at: Philadelphia, Carson City, San Francisco. 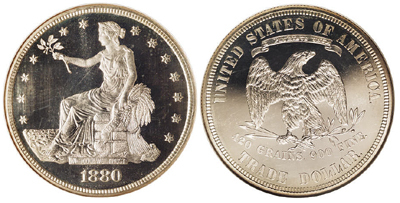 Years Minted: 1873 to 1885 Mint mark: On reverse below eagle and above the 'D' in the word 'dollar.' Notes: Key date 1878CC due to numerous coins being melted and low mintage. Proofs are rare too. Many trade dollars have been counterstamped with Chinese 'chop marks'. These marks typically devalue the coin.